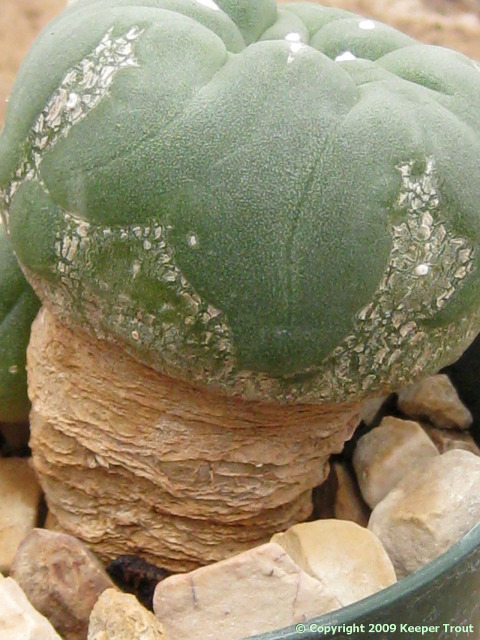 Léon Camille Marius Croizat (1944) Desert Plant Life, 16: 44. as Lophophora echinata var. diffusa. 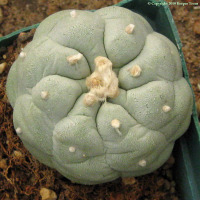 Helia Bravo Hollis (1967) Cactaceas y Suculentas Mexicanas, 12: 13, as Lophophora diffusa. This is a recognized species. Origin: Endemic Mexican cactus now found only in two relatively small areas such as around Peňa Blanca north of Vizarrón in the Mexican state of Querétaro [around 1,500 meters (5,000 feet) in elevation] and in another small population closer to Vizarrón. It is known to have formerly had more occurrences that now appear to be gone. 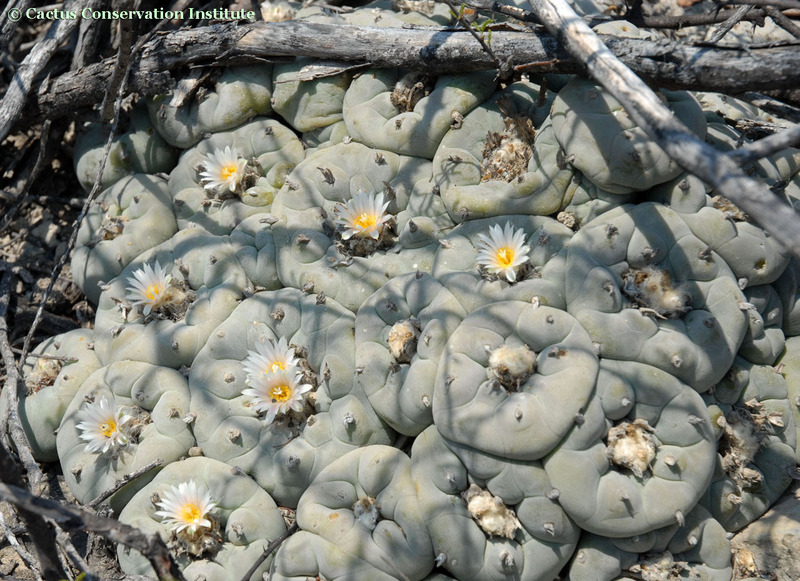 Habitat: Lophophora diffusa‘s habitat is stony limestone hillsides covered by thorny plants with thickets of both thorny and unarmed microphyllous shrubs (many of which serve as nurse plants). One ould like to suppose this species had a nice start in botany. 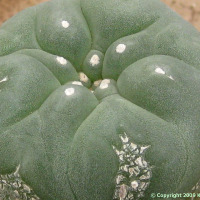 A major problem began when Léon Croizat inexplicably decided diffusa should be placed as a variety of Lophophora echinata. We will return to this again in a moment but the peculiar amount of confusion surrounding the entry of this species into botany needs to at least be mentioned. Lophophora echinata Croiz. diffusa var. nov.
A var. typica podariis latioribus quam longis inter se arcte confluentibus, obscure conicis differt. 1937, excl. descr. syn. omn. One can only puzzle as to what Croizat was thinking. I suspect that many of Backeberg’s problems originated with his use of Croizat’s descriptions as a basis for his classification within this genus (apparently not caring that some was based on Rouhier) and that this was largely the source for the confusion surrounding echinata as it is now known in horticulture. Normally solitary, they can form large clumps. Plants are soft, succulent, often globular in shape, somewhat flattened, 2-7 cm. high, and 5-12 cm. in diameter. They are usually lack well defined ribs and furrows, podaria are rarely elevated but are broad and flat; especially so on larger old plants. 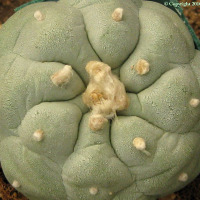 (Some Japanese cultivars such as “Big Breast” have been selectively developed for sake of having large and prominent podaria.) 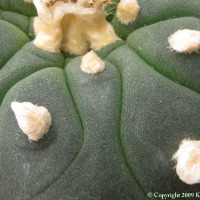 In contrast to the more regular distribution seen in L. williamsii, the tufts of hair are spread unequally on the prominent podaria. Old plants may form up to 13 very sinuous low spiral ribs sometimes with well defined tubercles in the sense commonly regarded as being for “decipiens”. Areoles are circular and small, set 1-2 cm. 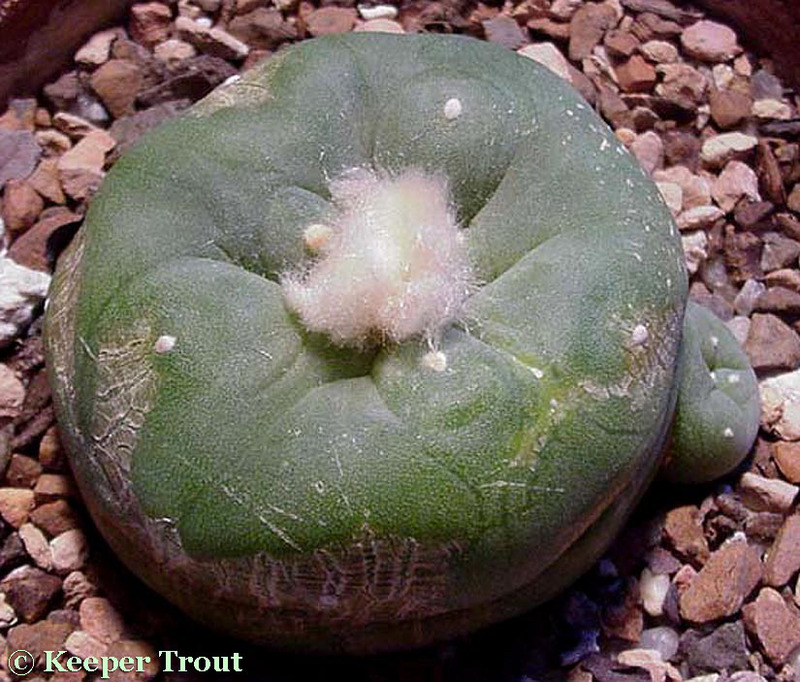 apart, ranging from 2 to 3 mm in diameter, bearing a small tuft of short white or grayish white hairs. Flowers are white or faintly pink but sometimes appearing yellowish-white (Anderson (1980) page 187); white or yellow (Habermann 1975); pale pink and occasionally almost a pale magenta. (Lamb & Lamb 1978); slightly pinkish-white and sometimes yellowish white (Bravo 1991). White style with 5 white stigma lobes. Claviform fruit is naked, 15 to 20 mm in length and about 8 mm in diameter, of a light pink color becoming red (according to Bravo 1971), a light pink-purple color turning brown at maturity (according to Bravo 1991), whereas a white fruit is commonly reported by growers. 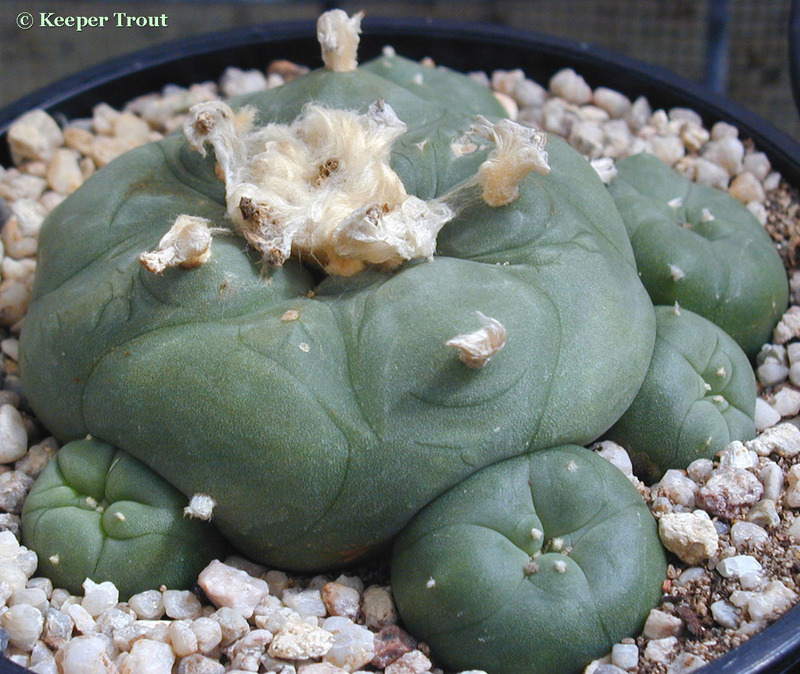 Bohata et al 2005 commented that the fruit of L. diffusa can range from white to a dark pink. 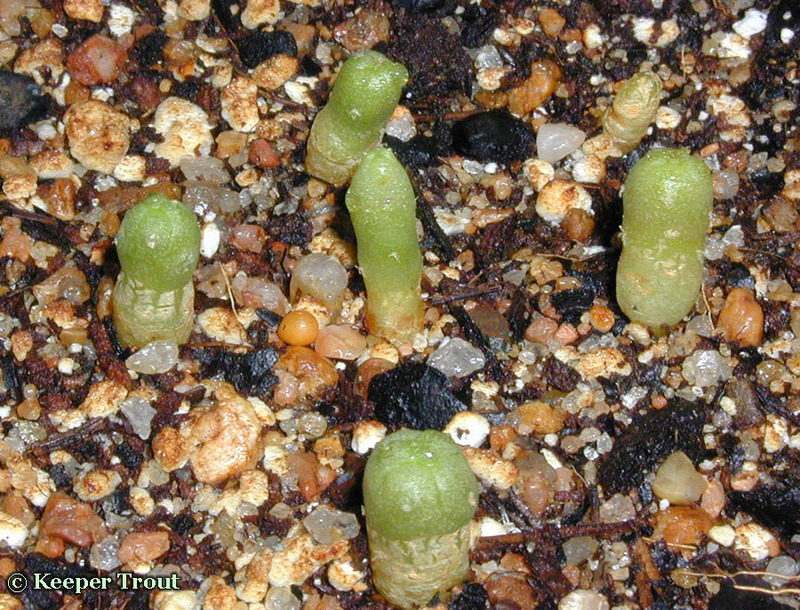 Kada & Koehres have both comment on L. diffusa typically producing many more seeds per fruit than L. williamsii. Flowering from May through June according to Bravo 1991. Pyriform seed, from 1 to 1.5 mm in length, with testa tuberculate. Pollen is 0-6 colpate, 26.1-48.5 mm in diameter. 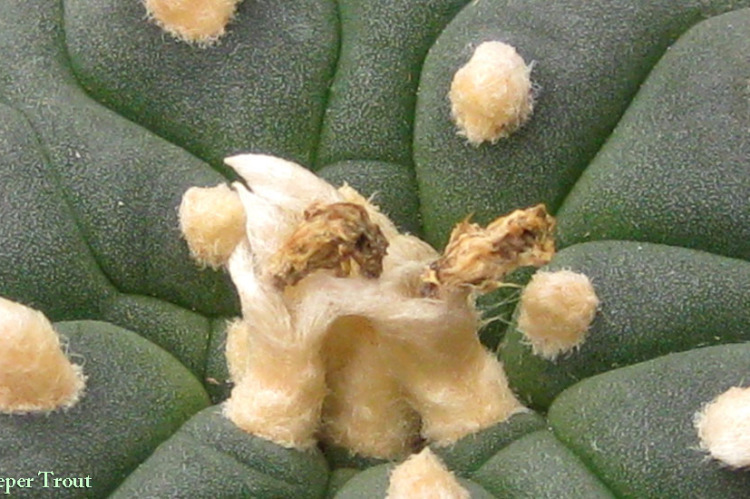 Pollen is much less variable than L. williamsii and shows a higher percentage of tricolpate grains. 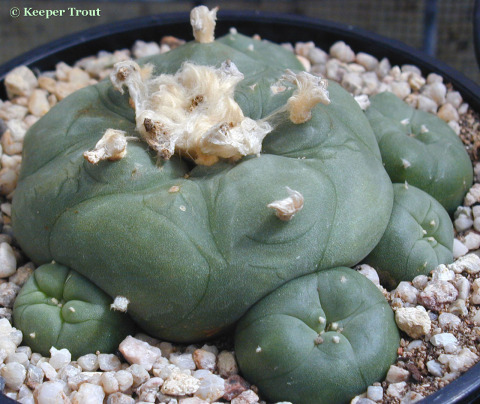 Heffter had apparently acquired Lophophora diffusa as peyote so noted Anhalonium williamsii during analysis to be chemically distinct from Anhalonium lewinii as he could only isolate pellotine from it. 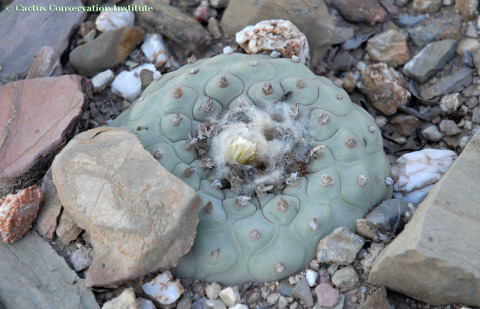 It seems probable that his A. lewinii was the dried material Parke-Davis had sent to Lewin. 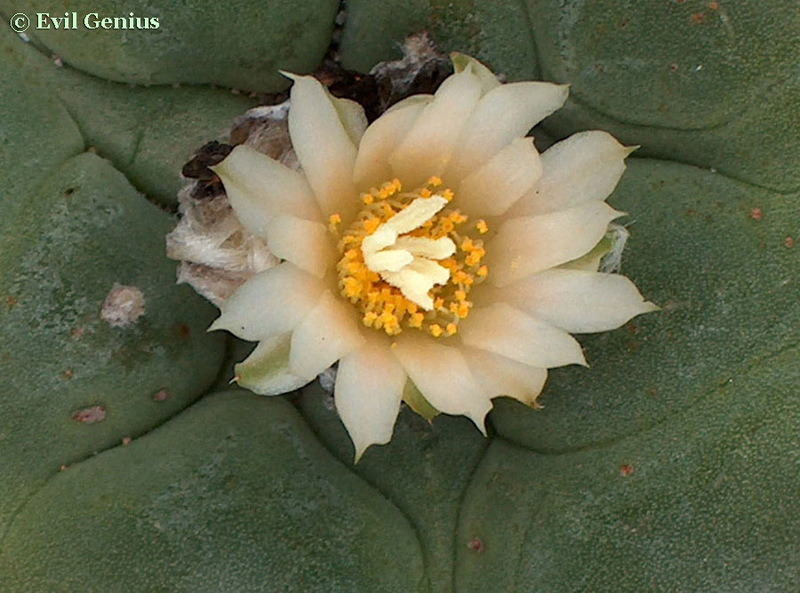 (From the latter Heffter isolated mescaline and several other alkaloids) Kauder and Lewin both also recognized there were two species based on chemical differences although only Heffter included illustrations. This topic is discussed in more detail in the comments on “Lewinii” and in the entry for L. williamsii (under its reported chemistry). Suggestions for more in depth analysis and revision of the genus went largely unheeded until fairly recently. 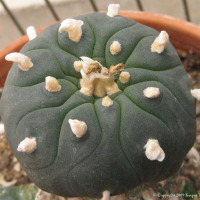 Even as late as 1959 the Bulletin on Narcotics insisted on referring to peyote as a monotypic genus consisting of only Echinocactus williamsii (Anhalonium williamsii), rejecting the name Lophophora entirely (Echinocactus williamsii was described by Lemaire 54 years prior to Coulter’s separation of the genus Lophophora). They interestingly dismissed Anhalonium lewinii as a pseudo “new species” [Note 3]. 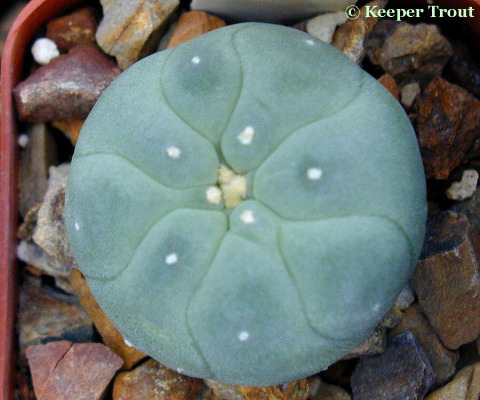 Britton & Rose similarly also believed there was only one species; Lophophora williamsii. 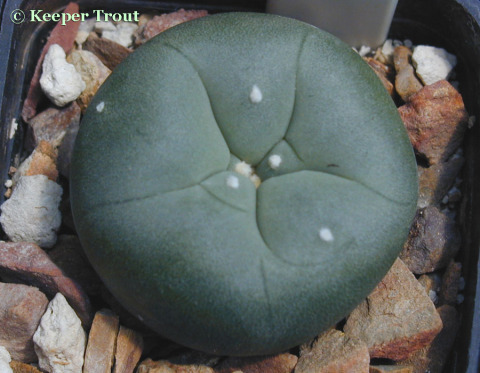 Despite their visible differences and observable differences there is still occasionally a lack of agreement between those who consider this a separate species (now this is most modern authorities) and those who consider this a variety of L. williamsii (a steadily decreasing minority). 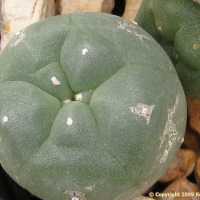 Mescaline (As traces or absent entirely.) Traces in tops & roots (tlc) Todd 1969 [Wild material: Queretaro, Mexico]; Minor base: Habermann 1977, 1978a & 1978b (from Anderson 1980 & Štarha nd); 0.018% (± 0.012) Habermann 1978a (from Štarha 1997); 0.003% by dry weight (isolated): Siniscalco 1983 [Note 4]; 1.2% of total alkaloid: Štarha 1997; Not observed by Bruhn & Holmstedt 1974. Plants collected 26 June 1967 near Vizarrón. Anhalamine was only in above ground portions while the other four alkaloids were equally present in root & above ground portions. Todd’s work was entirely based on tlc. Bruhn & Holmstedt 1974 were unable to identify mescaline but observed N-Methylmescaline to be present in trace amounts in the nonphenolic fraction (using GLC-MS). There were other alkaloids present that were at levels too low to identify. One of these turned out to be O-Methylpellotine and they published the details in a subsequent paper. See below. In fresh whole plants, they found a total alkaloid content of 0.90% of which 98% was phenolic and 2% was nonphenolic. Pellotine was identified as major alkaloid in phenolic fraction. Small amounts of anhalidine and trace amounts of both anhalonidine and hordenine were observed in the phenolic fraction as well using tlc and gc. They did not observe anhalamine. Anhalamine and mescaline, if present, were at trace levels too low for them to detect. They made no mention of lophophorine. Plants were collected north of Vizarrón on 29 June 1971 by Jan G. Bruhn and Hernando Sánchez-Mejorada.Herbarium voucher was made. Bruhn & Agurell 1975 identified O-Methylpellotine as a trace component of L. diffusa. Identified by tlc, GC and GLC-MS with a known reference sample. Principle alkaloid is pellotine (over 90% of total alkaloid).